Slyne Consulting is a new start-up consultancy providing professional services to the construction industry. This fledgeling company required a creative logo design and stationery set design, including letterheads, business cards and compliments slips. In February 2016, Hazel Ronson, Founder and Managing Director of the newly formed Slyne Consulting, asked us to design a logo and identity for the new company. Having worked with Hazel previously, during her tenure at Minshall Construction, we jumped at the chance to collaborate again. Her new Lancaster based business Slyne Consulting provides professional services for the construction industry. The main focus of the business is the design, delivery and construction of steel framed buildings, primarily to the agricultural market. The new logo design had to reflect the nature of the new business, whilst standing out from the competition, in what is a crowded sector. When designing new logos, we often begin with an exhaustive research phase. We look at rival companies and/or products, trends within the wider industry, as well as looking in detail at the actual products and/or services that the client provides. In this instance, our research indicated that the most popular corporate colours used by companies in the steel framed building sector were blue, black and red. Our logo design solution used grey, to represent the steel aspect of the company, and a rich purple to help lift the identity design above other rival businesses. When researching the products and services that Slyne Consulting provide, we had the opportunity to review some of their technical drawings. This lead us to our key finding which inspired the final design. We focused the design on the ‘Y’ in ‘Slyne’. This ‘Y’ directly related to the King Post and Truss Web of a typical roof truss. By using the main colours of grey and purple, separated by a bold diagonal slash, the slash became the Top Chord, the final element of a roof truss design. The logo and identity design has a bold, unique look and striking design, one which echoes the services and products offered by the client’s business. 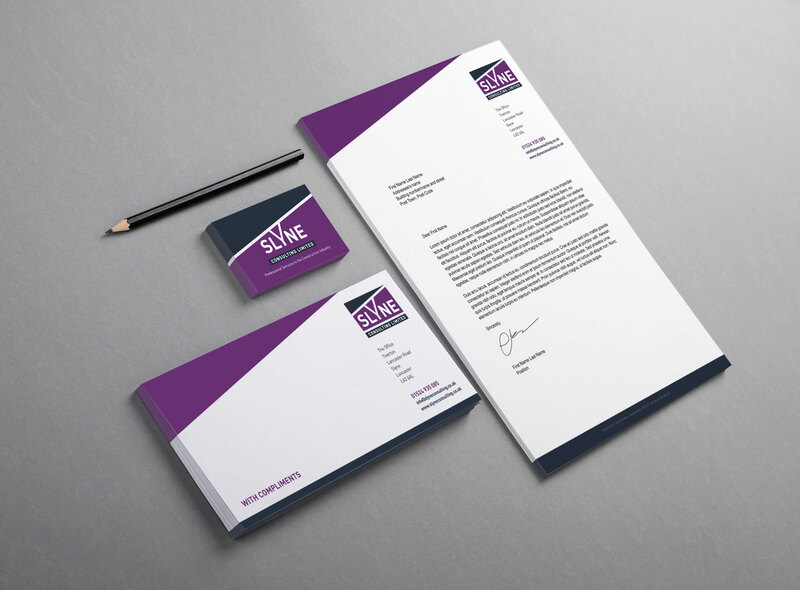 The new Slyne Consulting logo design was then applied to bespoke a Business Card design and a fresh, clean Letterhead design with matching Complements Slips. The Slyne Consulting letterhead design and compliments slips were printed full colour on a crisp, white 120gsm laser compatible bond. The business cards were printed both sides on a high specification 450gsm silk paper and then matt laminated throughout, to add to the high quality, tactile feel.